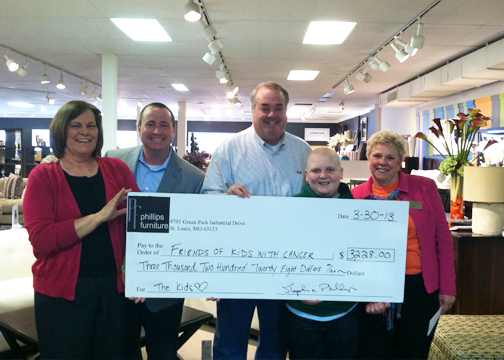 Friends of Kids with Cancer | Phillips Furniture's 75th Anniversary Celebration Raises $3,200 for Friends! Phillips Furniture's 75th Anniversary Celebration Raises $3,200 for Friends! Phillips Furniture in Kirkwood, a locally owned family operated business, celebrated their 75th Anniversary the week of March 14 through the 24th. On their entire purchase and was eligible to enter their drawing to win a $1,000 shopping spree. Luke who is presently in treatment for cancer made a special appearance to draw the winning ticket. Steve Phillips,President and CEO of Phillips Furniture present a check for $3,200 to Friends of Kids with Cancer.